Those who read Milton Steinberg's masterpiece novel "As a Driven Leaf" will remember that eternal life is a reward given for the fulfillment of two mitzvot (commandments), namely the honoring of one's parents and the shooing of the mother bird from the nest before taking her eggs. However, yesterday those who wanted to taste eternal life could have simply logged into the preeminent online auction website eBay.com and offered a bid on heaven. Ari Mandel of Teaneck, New Jersey, a self-proclaimed former Ultra-Orthodox Jew, listed his place in The World To Come on eBay for a mere 99 cents. Titled "My Portion in Olam Habaah (Heaven)", Mandel says he did it as a joke and didn't expect that bidders would bid it up to $100,000. Mandel, 31, included several references to the Jewish concept of Olam Habah (the World to Come) and used common Yiddish phrases in his auction listing. He claims to have simply done this as a joke and tells those who took it seriously or were offended by his harmless prank to "chill out". 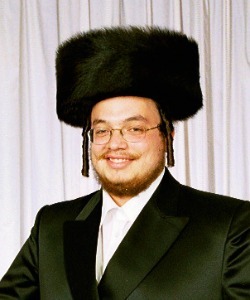 The Forward reports that Mandel was raised in an ultra-Orthodox community in upstate New York, but left the community about seven years ago. He is now a divorced father of one child and a student who works as a part-time translator. While eBay didn't allow his auction to last very long, he was able to get his joke spread pretty wide thanks to the speed of the Internet. For those who held out hope that they could really get a spot in heaven by a simple click of a computer mouse button and a six-figure payment, keep working on it. You'll have to go back to honoring your parents and shooing away mother birds. This isn't the first time that eBay has been used to auction off an intangible Jewish concept. 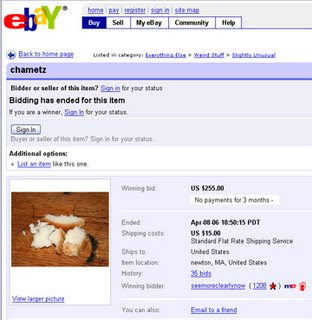 Back in 2006 on this blog I wrote about a man who used eBay to auction off his chametz (leavened products) before Passover (see below). It turned out to be a great way to raise money for the Ziv Tzedakah Fund, Danny Siegel's wonderful nonprofit organization.